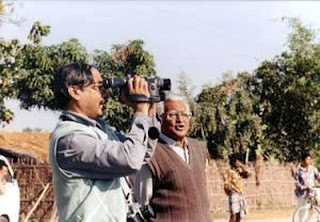 Comrade Souren Bose was one of the pioneering figures of the Naxalbari uprising and CPI (ML). He was an active member of the anti revisionist squad of the CPI (M). At the congress of the Communist Party of India (Marxist) in 1964, he questioned the absence of the portrait of Chairman Mao Tse-tung, and severely criticised the neo-revisionist party leadership. After the Naxalbari upsurge, comrade Bose went to China and met Chairman Mao Tse-tung. Next to comrade Saroj Dutta, he was Comrade Charu Majumdar’s comrade-in-arms, and the formulator of the concept of authority. He was one of the polit bureau members of the CPI (M-L), and the Secretary of the East Indian Zonal Committee of the Party. He revisited China in 1971, and met comrades Chou En-lai and Kang Sheng, with whom he discussed several important issues regarding India’s New Democratic Revolution. After his return to India, he was arrested and put into prison. After Comrade Charu Majumdar’s demise in 1972, he and a few others came out with an open letter, criticising the basic political and organisational line of the CPI (M-L). This letter was based on the "11-point suggestions", offered by comrade Chou En-lai, during Comrade Bose’s visit to China. In early nineties, he joined the CPI (ML) Red Flag, and became its General Secretary. He authored a number of titles. His Bengali book, Charu Majumdarer Kotha chronicles almost all the important aspects of Indian Revolutionary Movement till the first phase of the CPI (ML). Comrade Bose breathed his last in 1999.